Sorry I didn’t post yesterday. I was at the funeral of an aunt. The last in the long line of my mother’s siblings. Very sad but on the upside, I met up with lots of cousins I hadn’t seen for years and in true Irish style, we repaired to the pub after the reception. To my astonishment, I discovered I have 38 first cousins on my mother’s side……..beat that! That’s good Irish farming stock! Needless to say, since they are spread far and wide, I have never met a lot of them but am hoping to one day. 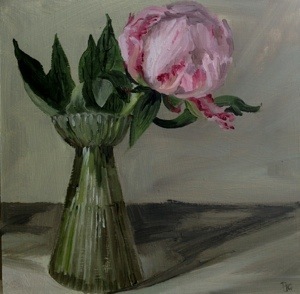 Here’s another version of the peony. Loving this weather! Bubba is sparko on the grass, lapping up the rays. The studio is pretty warm today. I’ really happy with my new veggie patch, made for me by my clever godson. If you need any landscaping done – he’s your man. Luke Warren, the Groundcre Company, 07515287913. Shameless plug but what are god others for? Plus, he’s a grafter and very good. Ok enough said. Life is just…… I inadvertently sent this out earlier without the image…apologies. Well, a lovely day in the studio, popping out every so often to check on the sunshine. Perfect. Hi everyone, i’m back from week in London and Landmark art fair. Very enjoyable but exhausting! Welcome to all my new subscribers. Here’s a lovely peony that my local florist was about to ditch as it was past it’s best. A freebie…that’s what I like. I was in the MIN shop yesterday painting in the window. It was good fun and I got lots of thumbs up from passersby. It was lovely to meet other Northants artist including the incredibly talented Sam Wadsworth.. Check out his website…..great portraits and landscapes. Here are the sweet Williams I painted in the shop. Off to London all next week so no posting. I will be at the Landmark Art Fair in Teddington next weekend so if you’re nearby pop in. If you’d like private view tickets (Friday evening) or 2 for 1 tickets for Saturday or Sunday, email me and I will leave them on the door. See you in a week when I will have lots of paintings to show you! After collapsing in a heap yesterday evening, I was up early painting today but they are wet and therefore don’t photograph we’ll. in the meantime, here is one going off to the post office in a minute and a photo of my stand at Patchings. Phew! Back from Patchings and just about unpacked and sorted…..kind of. It was a lot of fun, I met loads of lovely people including some artists I’d long admired and even got some sunshine to boot, though not a lot! So anyway, welcome, welcome to all those lovely new subscribers, I hope you enjoy my ramblings and more importantly my daily paintings. Speaking of which, I’m not quite sure just how daily they’ll be in the next weeks as I have another show coming up that I must prepare for. Firstly, if you are in my area, I am going to be painting in the window of the Made in Northamptonshire shop in St. Gilles st, Northampton on Thursday morning. If you’re passing give me a wave or better still, come in and say hello. I will no doubt feel a complete lemon or maybe like one of those ladies in Amsterdam. Don’t think I’ll wear the suspenders though! Here’s one I made earlier as I haven’t managed to get to the easel today yet. What a lovely day. Sadly, I have been too busy to be outside but maybe next week, unless it rains! Off to Nottingham tomorrow so no posts until next week. Enjoy the sun. My lilac tree was in full bloom yesterday so I picked an armful and stuck it in this large jar. I’m packing up for Patchings Art Festival this coming weekend so no daily today or this week in fact. Heading up there on Wednesday to hang (paintings! )and it opens on Thursday. Looking forward to meeting lots of people, so if you are nearby, please drop in. There will be lots of artists, artworks and art materials for sale plus cream teas! Here is a larger painting I’m just loading up. Have a great week of sunshine. Scorchio! Not a moment too soon. Bubba is sunbathing by the back door and Floss is revising in the sunshine at last. Apple blossom on it’s last legs now, bumper crop this year methinks.